I absolutely agree that the death of this thug won't resolve terrorism. The signal is however rather important..
Islamists: religion has always been the tool of tyrants and manipulators throughout history including today as well. There is an interesting side to this that to believe in a God or some supreme spirit of your choice , you have to belong or subscribe to a religion. Fact is you don't. It's like saying if you play golf you have to belong to a particular golf club which is nonsense. But the ignoramuses can't even grasp this elementary consideration.. In addition to your two questions, I would be pleased to hear you on another one. Why was the body sunk ? Fully disagree with your short view on the root cause of the terrorisme ! Even if you solve the Israeli Palestinian conflits . The Islamic terrorism will NEVER END. which means that there is a hiding serpent under a rock, in this matter. When we go back to the "Blog articles of tdg.ch" you can read an article under the statement in french"On ne meurt que deux fois" http://www.welfarestate.com/binladen/funeral: This article states that the death of Binladen is situated many years ago already, where he died with lungs complications. How can people believe that the public enemy No. 1 has been killed with no real proof to be seen and given to them. 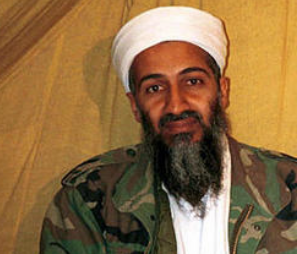 Unless the public can see a video or a picture or any real proof of the death of Binladen, there is no way they can believe this scenario, maybe organized just before important elections....this is the question. If our "boys" never found him for about ten long years, this is maybe because he already passed away many years ago...! I am very skeptic about this annoncement, sorry...! Whatever happens, the world is undoubtedly a better place without Osama. I think even liberals can agree with that. The only thing I fear now is reprisal attacks from Al Qaeda and all the various other terrorist organizations out there. Islamic terrorism will never end, what Al Quaeda and other bearded misfits want is Sharia applied all over the World, Ossama was just the king on the checkboard, a worldwide checkboard with thousands pawns. Many thanks for the question. From the US perspective, any trial would have been very difficult for numerous reasons. However, in terms of justice, a trial is a trial and the rule of law is the rule of law. A tough call, but I would have preferred a trial.